I wasn’t surprised in the least when, upon comparing notes, Leah and I both found design inspiration in this oddball character. The Log Lady often wears large, cozy, traditional colourwork sweaters akin to the much beloved Cowichan. That sweater style is perfect for this character and for the show in general. Developed in the southeastern area of British Columbia nearly 100 years ago, Cowichan sweaters are a wonderful meeting of European colourwork knitting and the indigenous people’s fibre arts style, symbols, and motifs. Of course, the town of Twin Peaks is situated pretty much right there, across the border from BC in the States. This type of sweater also has a vintage look; it reminds me very much of fantastic pattern books from the 70s and 80s, but of course stretches much farther back than that. Just google “cowichan sweater mary maxim” for some fab results. I’ve always known I wanted to design the perfect Cowichan-style sweater. Something with hefty yarn, attractive colourwork, a zippered front, and cozy textured collar. I’ve also always know that if I was going to do one, it was going to be a super fun 21st century oddball sort. Just like me! This all leads to my own Log Lady sweater for the Great Northern collection. It’s a worsted weight. It’s long sleeved and cozy. And it features neon and neutral yarn from the wonderful British Coloumbia dyer RainCity Knits. 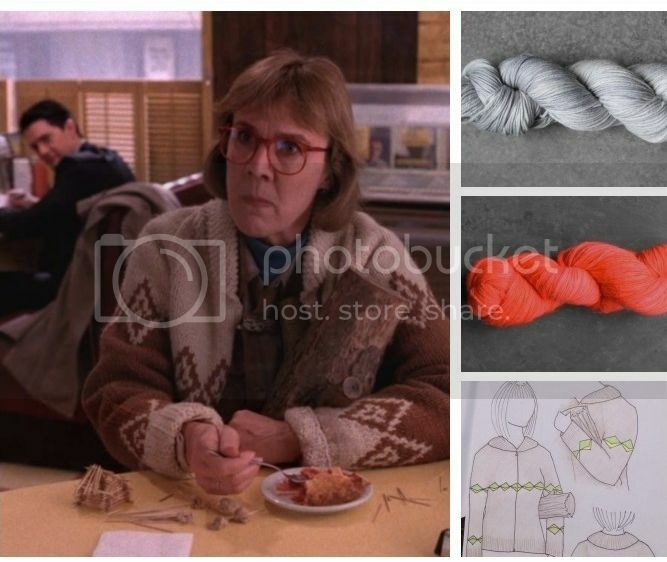 She’s absolutely the first person I thought of when the Log Lady sweater started coming together. People, I can’t wait to knit this and wear the hell out of it!